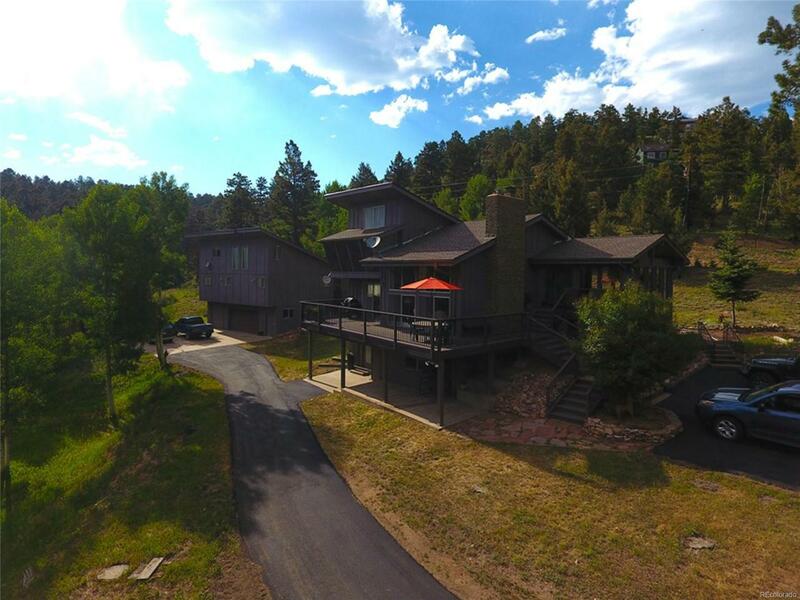 This lovely cared for home is nicely located on 2.3 acres of a mix of aspen and pine trees that create a park-like setting. New roof, new asphalt driveway. Large shed. Relax on the large trexdeck that wraps around 1/2 of the home. Sun room has space to create a wonderful dining/sitting area. Skylights make the kitchen bright, lots of cabinets, an Island and eating area. Stainless steel appliances and double ovens. Living room has a floor to ceiling mossrock fireplace, large windows, ceiling fans. Family room on lower level has a gas log fireplace. Lower level bedroom has french doors. Laundry room on lower level with utility sink, gas hot water heater. Mother-in-law apartment is located above the 4 car heated garage with cabinets and workbench area. This apartment has 1 bedroom, 5 piece bathroom, washer & dryer included. Open kitchen, living area with a large loft room.